This recipe walks through scheduling a movie to starting playing on loop. Being able to play back a movie automatically is useful in many situations such as museum installations, trade shows, and in office lobbies. 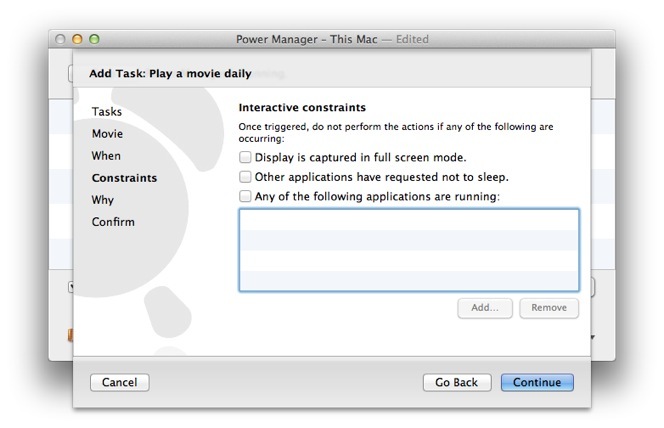 Getting a Mac to play a movie without human interaction can be tricky. 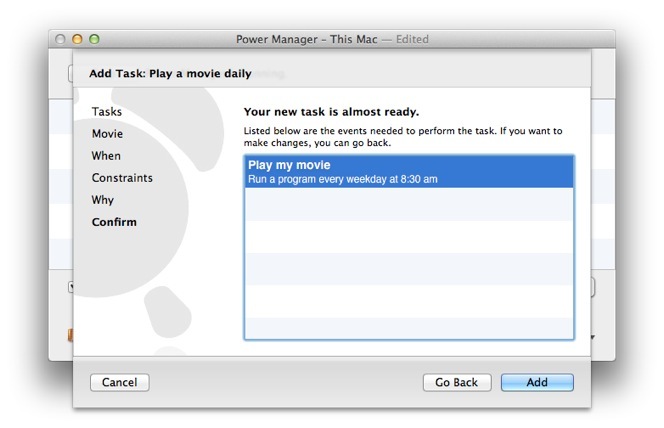 Thankfully Power Manager's new Play a movie task makes it easy. 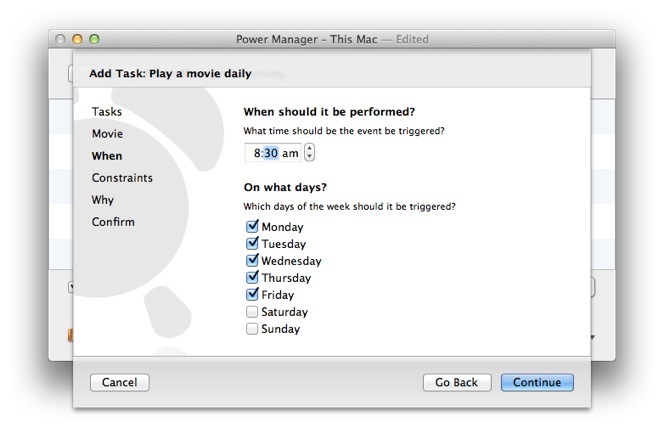 Power Manager includes a task that deals with launching your movie in QuickTime Player and starting playback automatically. 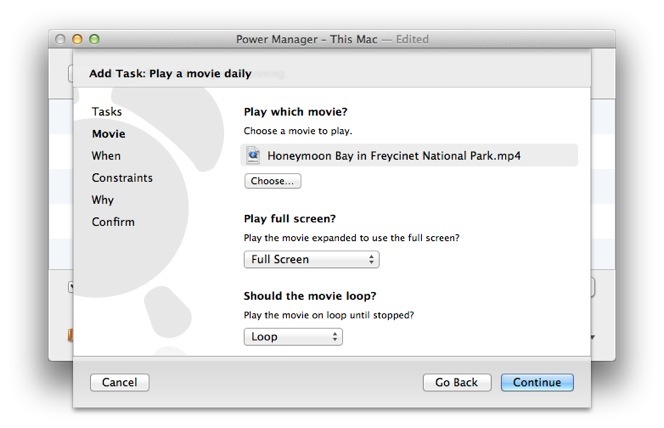 Through the task, you can play the movie back in full screen mode and ask the movie to loop forever. Both these features are optional but for most situations they will be ideal. This does sometimes work but sometimes it does not. This lack of consistency is what makes this AppleScript look simple and easy but unusable. If the movie has not finished loading by the time play is requested, nothing will happen. Sometimes loading is immediate and other times loading can take a moment or two - or even minutes. To fix this, our AppleScript must open the movie and wait until it is loaded. Only once the movie is loaded can QuickTime Player start playing it. Let's use the Schedule Assistant to create an event. 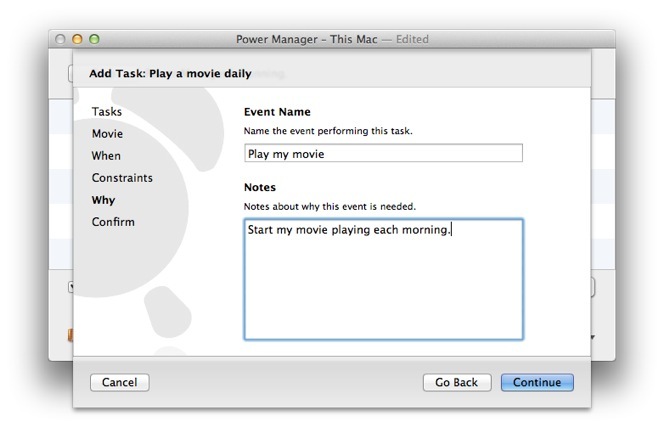 The event will automatically start playing a movie in QuickTime Player once a day at 8:30am. Choose or drag and drop your movie onto Play which movie? 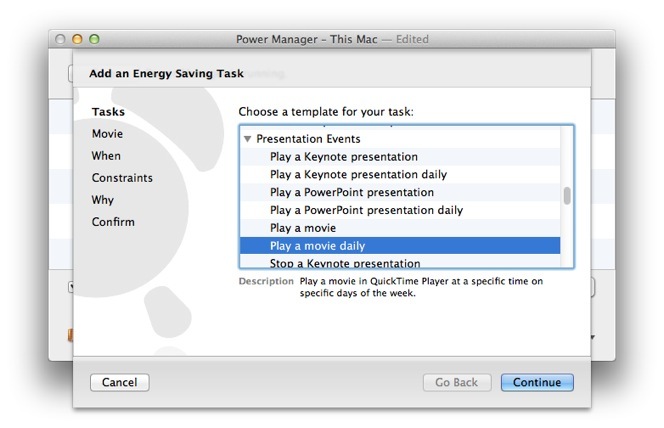 With the event created, you may like to create an event to power on your Mac a little earlier in the day. You can combine as many events as needed to get the behaviour you want. For an art installation, you might want to power on the Mac each morning, wait a few minutes, then start a movie looping in full screen mode. 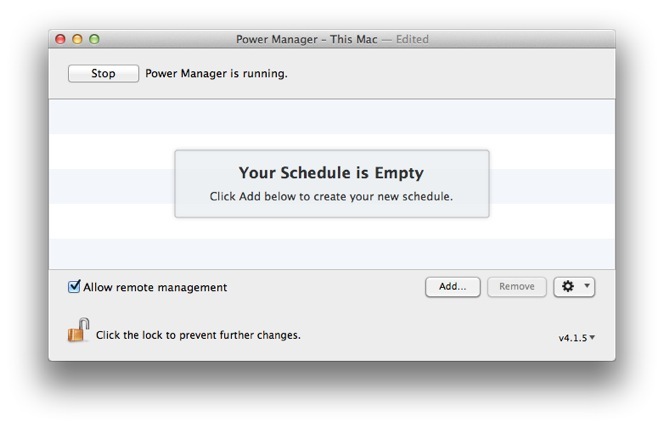 At the end of the day, another event shuts down the Mac for the night. These events manage the Mac without needing any human involvement or management. It just works. 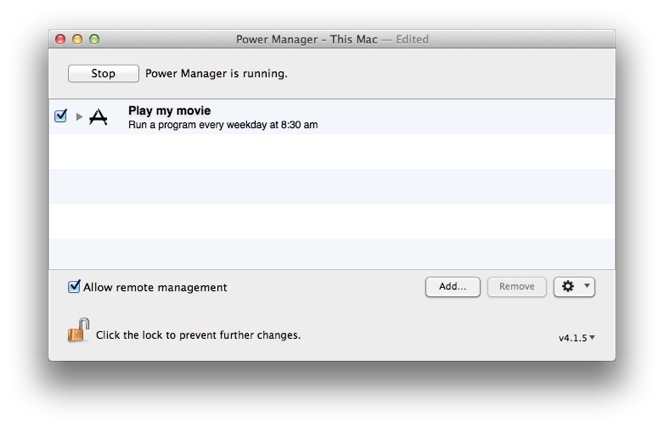 This article was posted in AppleScript, PM4, Power Manager, and Recipe and tagged movie, and QuickTime Player.